We would like to share with you the details for the upcoming January Special Event! - Details: Log In daily to obtain the Special Rewards for that day! *Bonus reward for logging in 7 consecutive days! ※Attendance is recognized when the daily login rewards are received, you must have claimed all 7 Daily Log In rewards to qualify for the SE ALL OVR 90+ Draft x1 Bonus Reward. ※Bonus 7 Day Consecutive Log in Reward will be sent to mailboxes within a week after 1/23 Scheduled Maintenance, no later than 1/30. - Details: Collect and exchange Golden Balls for Rewards in the Item Exchange! - How to obtain: Collect Golden Balls through 2 weeks of Daily Login Events and Opening the Golden Ball Box which can be opened for free every 6 hours during the event. EVENT 3. Boost Trainer Effect x2 Event! - Details: Boost Trainers will have double their effect during the event Duration! - Details: GP Cost for Boost Attempts will be discounted by 30% during the event duration! - Details: Quantity Limit of Material Player used for Boost Attempts will be increased from 10 to 15 Material Players during the event duration! EVENT 6. Perfect Training Result x3! - Details: Triple the Probability of a obtaining a Perfect Result when Training! - Details: League Buy Out Fee will be decreased from 95% to 70% only during this event period! ※Please note this fee can only be applied when a Player posted on the FA Market was not purchased during the Posting Period. ※Player must have not been purchased on FA Market for over 24 Hours. - Details: Can you guess which player? Submit your answers on the Form following Maintenance to earn GP! ※Only the Submissions entered between the Event Duration will be counted. ※Any Answers submitted before the end of 1/16 Maintenance and after the start of 1/23 Maintenance will not be counted. Last edited by OffTheWall; 01-17-2019 at 07:40 PM. 3x chance for perfect training, league buyout and the rest in the same week. Must see to believe. Keep it up. Apologies for the confusion, we have corrected the dates for the League Buyout Date. The correct duration of this event will be from: 1/18 7:00 AM PST and it will run through 1/20 6:59 AM PST. Last edited by OffTheWall; 01-17-2019 at 11:55 AM. We were able to confirm that the Golden Ball Giftbox is correctly in the Shop under the Item tab. Please note that this box can only be opened once every 6 Hours and that you can open up to a max of 4 boxes within 24 hours. Regarding the Boost Discount, can you please clarify what you mean by not seeing the discount? 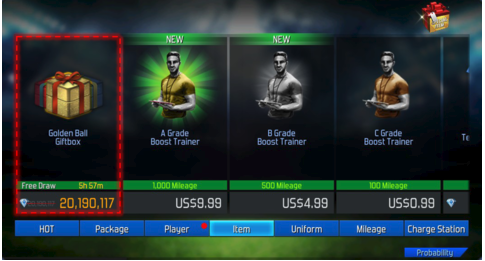 Are you not seeing the "Cost to Boost" amount not being correctly applied when attempting to Boost a Player? We are glad to hear that you are excited and looking forward to this week's events! We would like to let you know that the duration of the League Buyout was incorrectly displayed and that we have revised the post to display the correct event duration. Please make sure to note this new time when placing your Players onto the FA Market! These last few events have been great, but why do you make them unachievable? The last many, no one is able to get any of the top4 or 5 prizes without purchasing multiple packages and even then still not get close. 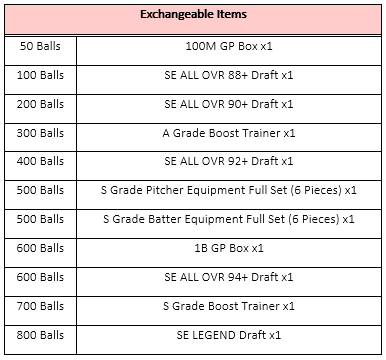 I collected all but 1 box yesterday and ended up with 12 balls plus the 10 log in. There's no incentive to login every 6 hours to collect them when they amount to nothing at the end.